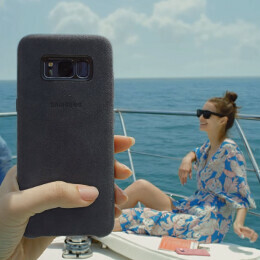 Samsung today released a new video to promote some of the official protective cases that the company has made for the Galaxy S8 and Galaxy S8+. In the video, you'll first discover a Clear View Standing Cover - which, in addition to protecting the dual-curve screen of the Galaxy S8, it lets you control calls, music, and other functions without flipping it open. Plus, of course, this transparent case can also act as an adjustable stand for viewing content in landscape mode. The second case model shown in the video is an Alcantara Cover - a stylish product with a suede-like finish. According to Samsung, this case is both durable, and stain-resistant. Finally, the third case is the controversial 2Piece Cover, which looks kind of weird, and won't really cover too much of your S8 or S8+. Interestingly, right now, from the cases seen in this new promo video, only the 2Piece one is available to buy in the US directly from Samsung (costing $19.99). Still, the Clear View Standing Cover and the Alcantara Cover can be ordered via Amazon, for prices starting at $25 and $37, respectively. What protective case would you buy for a Galaxy S8 or a Galaxy S8+ (not necessarily from the ones seen in this article)? Was that the 2Piece Cover designed by a designer who designed the original iPhone 5c cases? They look hideous, especially the 2 piece cover. Even a monkey can make better designs than this one. The most laggy phone in the market. You're 100% wrong. The S8 lags, as confirmed by Samsung. See links below. http://www.gsmarena.com/samsung_s8_launcher_updated-news-25884.phphttps://www.xda-developers.com/update-touchwiz-home-fixes-lag/https://www.youtube.com/watch?v=Q0Jkvr0sJR4 No matter how much all of you idiots deny the lag, it's still there. No matter how many times you try to bring up other phones and deflect, it's still there. Samsung G8/G8+ both lag more than they should, and this is a fact. Full stop. All computerized devices have some lag. It might lag but it seems to only bother non S8 users. Even I don't have S8 and I am a 7 Plus user, however my friends who own S8 don't seem to even be bothered by the lags. Even I envy S8 quite a lot. The lag issue just bothers non Samsung S8 users, may be jealousy? That gray one in tbe middle is horrible lol. Sammy was drunk on that one.